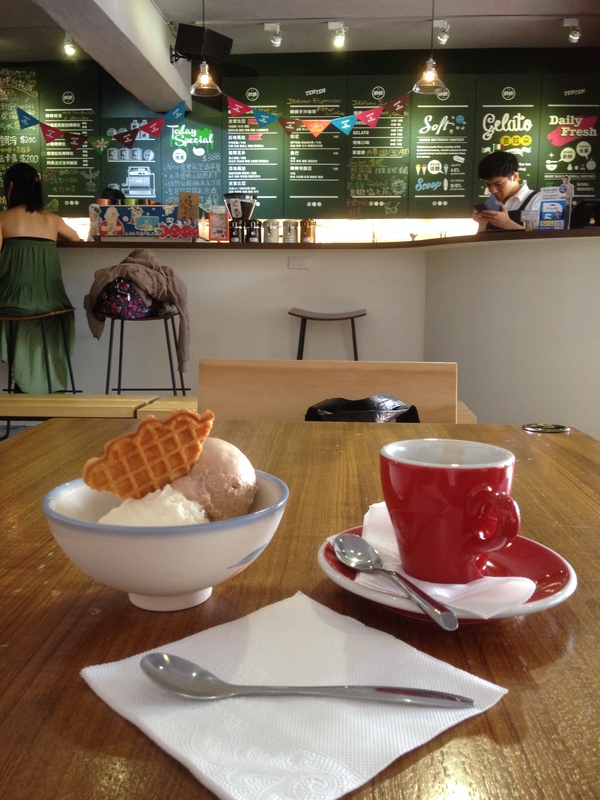 Hidden in a small alley in Songshan District, Tenten Gelateria may be the most attractive and comfortable ice cream shop in Taipei. And it may have some of the best ice cream, too! 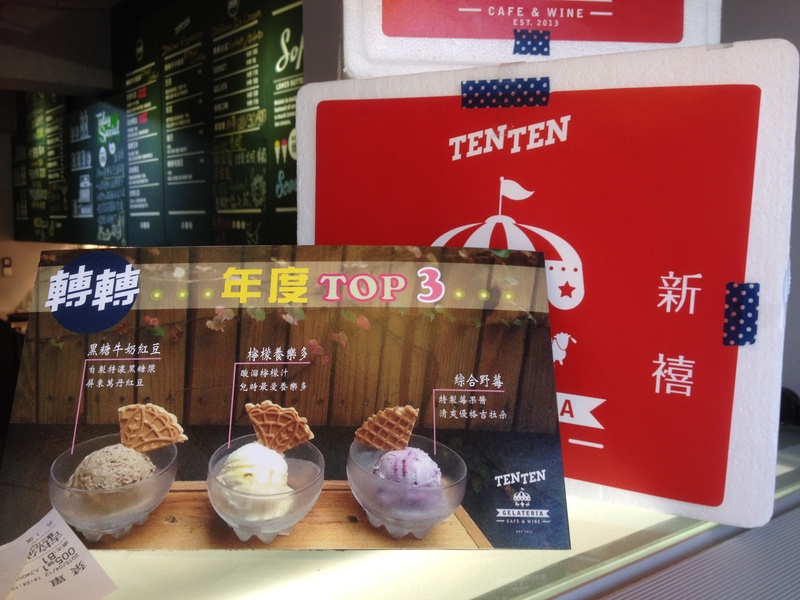 Taipei 2014 Handmade Ice Cream Reviews – Grand Prize! Tenten has delicious gourmet handmade gelato in all kinds of interesting flavours that are made fresh every Wednesday and Friday. Available flavours change daily. Tenten doesn’t offer samples, but thats fine with me – with such a well-made product, you really can’t make a wrong choice. Actually, having eaten so many kinds of ice cream, I’m starting to feel that not being able to sample the product before buying it is actually a good thing, because I can choose more easily and won’t have doubts about my choice afterward. The price is ok. One serving can include two flavours at $120 NT “for here” or $90 NT “to go”. At first I thought $120 was a little steep and I should just take it to go for cheaper, but the place was so nice I changed my mind. I figured it would be worth it to spend the extra money so I could hang out for a bit and take my time enjoying my ice cream, reading a book and appreciating the pretty space. The minimum purchase is $150 NT, so I ordered an espresso as well. They have a special deal where you can pair your ice cream with a coffee or tea for only $50, so the total was just $170. “Elvis’s Favourite” is banana and peanut butter with chocolate, named after the singer’s famous peanut butter and banana sandwiches – such a cute name! I love peanut butter and I love Elvis, so without hesitation I ordered a scoop of Elvis’s Favourite. This one was mainly banana-based, sweet and natural-tasting, with mild peanutty and milky notes – the chocolate flavour wasn’t very assertive. The texture is super smooth and creamy. It’s a fairly sweet flavour that pairs well with a strong espresso. Although it’s quite sweet, it seemed to be low-fat, without a heavy butterfat flavour or greasy mouthfeel. It’s quite clean-tasting. The other flavour I chose was “Sponge Baby”, or pineapple with rosemary and Amaretto. At the time I didn’t understand what “Sponge Baby” was supposed to mean, but I just Googled it and found out that’s the Chinese name for “Spongebob Squarepants”. So…I unknowingly ate Spongebob Squarepants ice cream. Only in Taiwan! Along with having a cute name, this ice cream had quite a special flavour. This was the first time I’ve ever seen rosemary in ice cream in Taiwan – this combination is rare even in the West. Rosemary is generally used in savory dishes like roast beef or pasta, but it pairs well with sweet foods. My favourite type of flavoured chocolate is rosemary. It’s amazing – if you don’t believe me, you have to go try it yourself! The pineapple flavour in this ice cream didn’t have the tartness of raw fresh pineapple – it had a rich, deep sweetness, like it had been cooked down. It tasted a bit like pineapple jam. I could taste the fresh, pine-y, menthol-y herbal taste of the rosemary contrasting with the rich pineapple, all wrapped up in a mild, creamy milky base. It tasted very special, very indulgent. When I finished eating I went and chatted with the staff a bit, and they told me I’d guessed right – the ice cream was made with cooked pineapple. They boil it down to concentrate the natural flavour and make it sweeter and richer. What’s more, they use this method in all of their ice creams as an alternative to adding fructose and other processed sweeteners – all of their ice cream is sweetened with house-made fruit juice concentrate. So awesome! Tenten also sells hand-poured gourmet coffee, as well as tea and other non-caffeinated beverages. The kind staff gave me a little cup of fresh hand-poured coffee for free. Their coffee is excellent, very smooth. 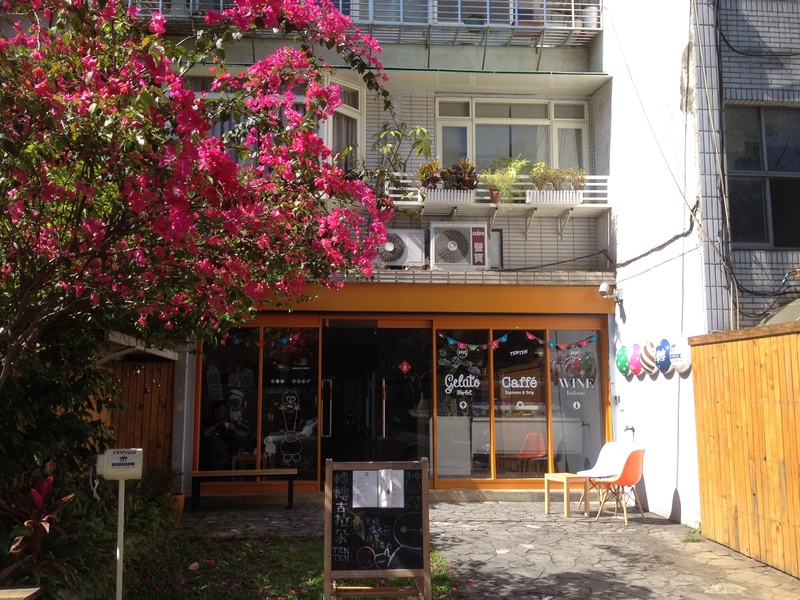 The shop is beautifully decorated, with photography and art exhibited on the walls. 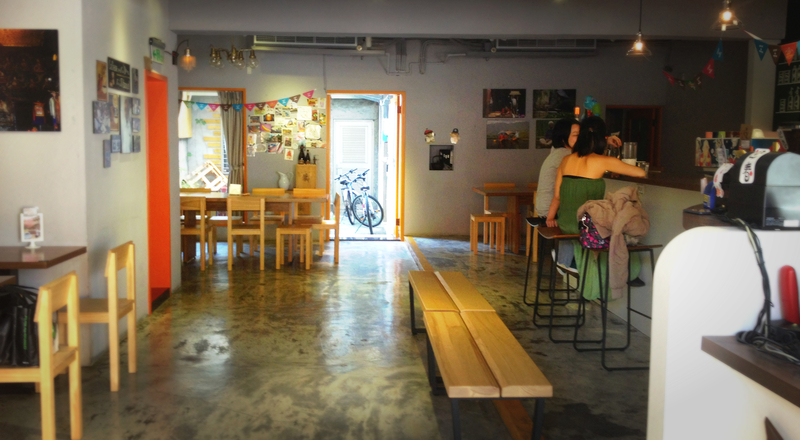 The space is large with a lot of tables and chairs. There’s even a cute little courtyard garden outside, and it faces Minsheng Park across the street, so the surroundings are pleasant and quiet. You could spend an exceptionally comfortable afternoon here gazing out at the gardens and watching local passers-by, reading a book and eating gourmet ice cream. 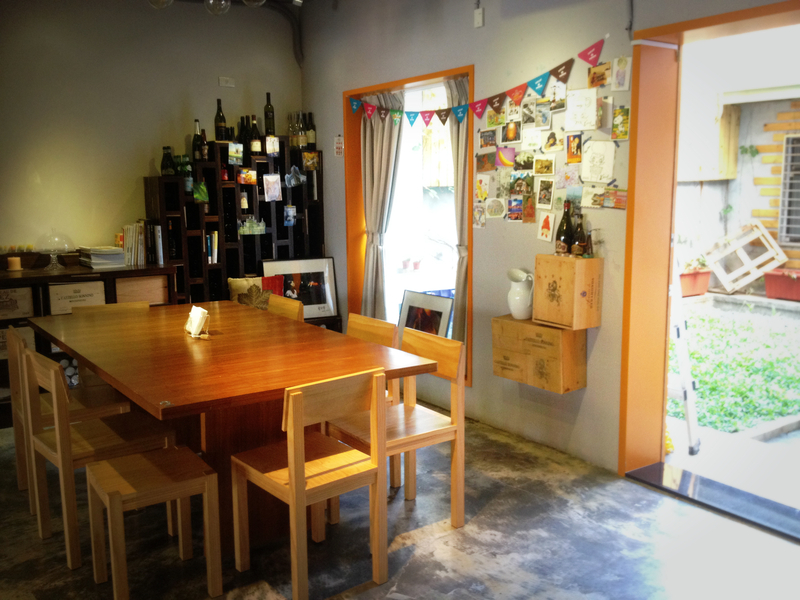 Along with ice cream and drinks, Tenten also offers sandwiches and quiche, as well as wine and craft beer. It’s a great spot to bring friends for afternoon tea or after-dinner drinks and dessert. They also have brunch on weekends. Overall, I think Tenten is a hidden gem well worth the hunt. I’m definitely going to come back to try more of their unique daily ice cream creations! Hi. I just wanted to let you know that I passed by there yesterday and found out the shop is closed. It was replaced by a liquor store. Oh dear – that’s sad news! Thanks for the update, Han.